They live in protected bay, rocky bottoms and swim to the surface 2 and 3 days after full moon to spawn during summer months. When captured they swim to bottom of container and create a webbed tube around itself with head sticking out one end and live like this until they shed the tube to rise to surface and mate. Females can reach 35 mm with average of 20mm, males are smaller at 12 mm in length. Glow worms have 2 sets of eyes with a visual pigment in the eyes that are tuned to pick up bioluminescent mating signals, a visible green color. Worms rise to the surface 57 minutes after sunset with peak 2 & 3 days after full moon. 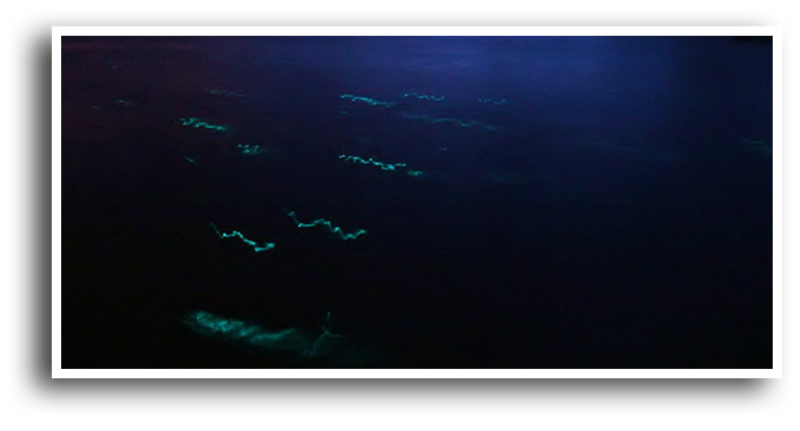 Females emit a bright green glowing liquid while swimming in circles along the length of their body’s. Males recognize the cue and swim up emitting short bursts of light. When they meet they swim around each other ‘shedding their gametes’. They then return to the bottom, lose their swimming setae and build new mucus tubes. Fish which ate the worms have been found paralyzed due to the extreme toxicity of the worms. They do not die after mating. Pigment change as worms age has been observed. Glowworms have close cousins in St Martin, Belize, New Zealand and East India. The first reported sighting of them was by Christopher Columbus in 1492.